Libraries and book stores depend upon latest technology barcodes to quickly access desired products from large volume of books, magazines etc within less time. Circulation of books and keeping their records is now possible by aid of the barcode technology. 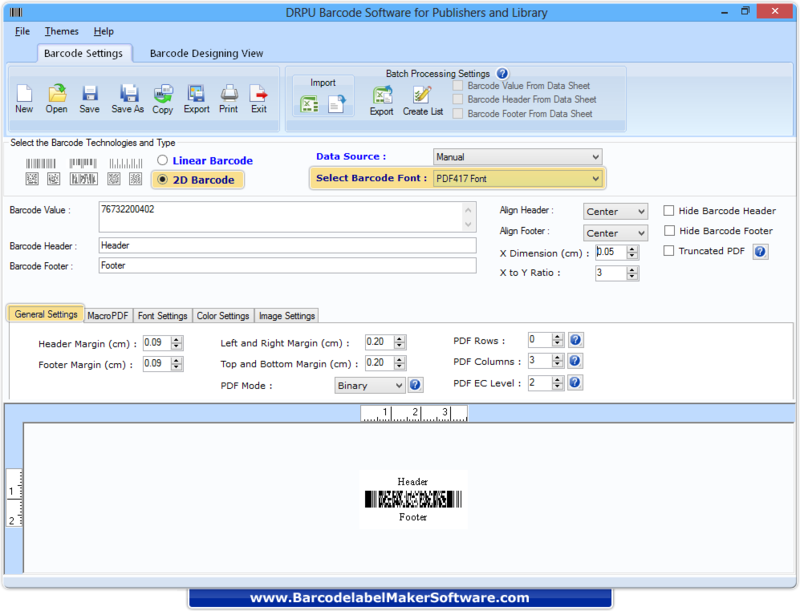 Barcode label maker software has ability to fabricate library barcodes, stickers or publisher barcode labels for book publishing industries and publishing houses. Go to barcode settings and set attributes of barcode (like technology (Linear or 2D), font type, header-footer value and alignment) as per need. Barcode generator software builds book barcode labels, stickers and tags using major linear and 2D barcode fonts. Multiple barcode labels can be printed altogether. Multi copies of the same barcode label can be printed on a single paper. Print preview functionality prevents from further printing errors. Barcode creator software supports all commonly used barcode printers and scanners. Barcode generator platform of the barcode system software is enclosed with image designing objects that fabricates library or book barcode labels. Software offers sequence generating features to create multiple barcodes.